I'm prepping talks for a few conferences. I think I've got my workflow down for syntax highlighting slides in Keynote on my Mac. ​1. 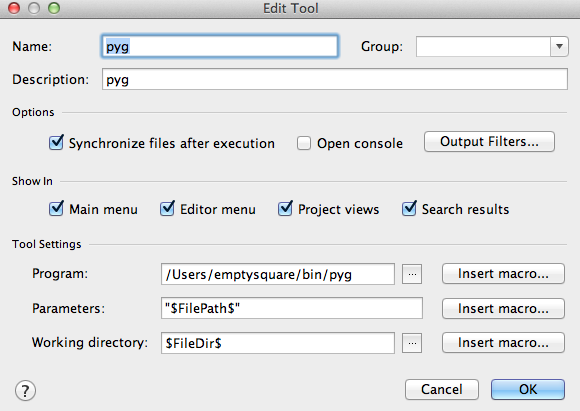 "pip install pygments", not in a virtualenv but in your default Python. You can leave "Open Console" checked while you're getting things working. Finally, in the "Keymap" section of PyCharm's vast settings dialog, search for "pyg" in the filter box, right-click on it, and assign a hotkey of your choice to the tool. I chose Command-Y because it was bound to some weird function I don't use. 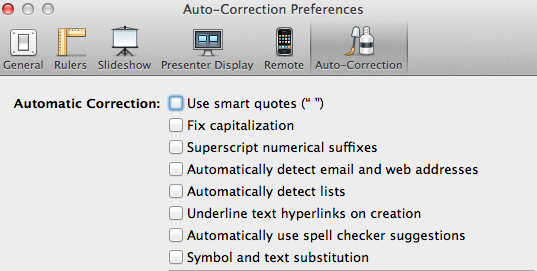 Now whenever you're editing a file in PyCharm, you can save it and hit Command-Y, then switch to Keynote and paste. Readers, if anyone can tell me how to adjust the default font size in Pygments for RTF output specifically, that'd be great.